The Nobel Prize in physics was just announced for 2017, and the winners are three physicists who found proof of something called "gravitational waves," which were predicted by Albert Einstein a hundred years ago. 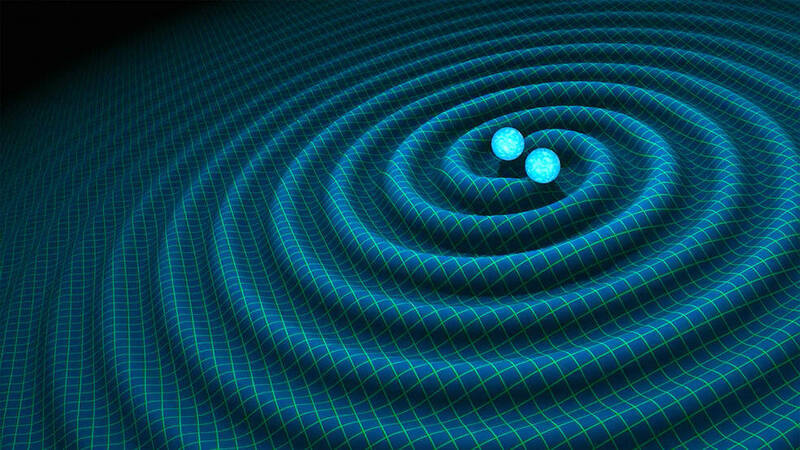 They found these gravitational waves being generated by two black holes colliding a billion light years from Earth. Want to learn what they did and how? Read on! A hundred years ago, Albert Einstein developed the Theory of General Relativity. It said that the force of gravity, which holds us to the surface of the Earth and keeps the Earth orbiting around the sun (and, really, makes the whole universe work) is actually because massive objects literally bend space. If you put a bowling ball on your bed, the mattress will drop down. Roll a marble along the bed, and it will fall towards the bowling ball. That's how gravity works, too. Einstein did a whole bunch of mathematical calculations and discovered something else: that if objects were speeding up or slowing down, or changing direction, then they would also give off gravitational waves. In other words, space would not just bend in a curve like the bowling ball, but you would actually get tiny ripples like when you throw a pebble into water. The problem is that those ripples are really small, so nothing could detect them. There wasn't anything massive enough nearby to make gravitational waves we could detect, and because the waves get weaker the farther away you get, all the massive stuff was too far for us to detect. To fix this, scientists developed LIGO, the Laser Interferometer Gravitational-Wave Observatory, funded to the tune of a billion dollars by the National Science Foundation, and put together by MIT and Caltech. Here's the challenge: We have to somehow detect the fact that space is contracting and getting bigger between two objects - the two objects are getting just a tiny bit closer or farther away even though they're not moving. But the amount they're getting closer together is way too small: the two objects might get closer by 0.0000000000000000001%. You didn't read that wrong. That's one part in 10^15. You'd never be able to see that! Even that far apart, the biggest gravitational waves we might see would still only change the length of the tube by less than the width of a proton (which is a tiny, tiny part of an atom). But using lasers, scientists were able to set up a system that could detect even so small a change in length. Actually, LIGO wasn't just one observatory, it was two, one in Washington and one in Louisiana. They had to build two of these huge things because with just one, if something shakes the building (like a storm or a small earthquake or a tree falling), the detector might get a false reading. But with two, you can check to see if they both got the same readings, and know for sure that it was something from outside Earth. On September 14, 2015, both detectors picked up a signal. Scientists rushed to examine them. Did they look like signals from two objects in space colliding, which might make a strong enough signal? Yes. Could it be an accident, like a tree falling? They did a lot of probability, and confirmed that the chance of both detectors getting the same signal at the same time was too small to be coincidence. It was real. Here's the big deal. Scientists figured all this out - how big the black holes were, where they were, how fast they were circling each other - all from the gravitational waves they detected. They used the math in Einstein's theory of relativity and solved it from there! One hundred years after Einstein predicted gravitational waves using a mathematical analysis of his theory of general relativity, we found them. It's amazing that science could make a prediction so long ago that would finally be proven now. However, this is much more than proving Einstein's old theory. Now we can detect things about space using gravitational waves. We never would have found those two black holes without the gravitational waves, because you can't see black holes: they don't give off any light! But they do give off gravity, and now we have a way to "see" it. Up until now, basically everything we've been able to tell about outer space comes from one of two things. One is "electromagnetic radiation," which is a fancy word for light (it includes things like x-rays and gamma rays and infrared radiation, but it's all just different wavelengths of light). But electromagnetic radiation gets blocked by dust particles out in space, so we can't see very far with it. The other way to tell anything about outer space is math, using it to make theories about what must be there. But without seeing anything to confirm the math, we can never know for sure. Well, gravitational waves aren't blocked by dust. They keep going regardless, because they're part of spacetime itself. Using them, we can see much farther out than we could before. Because gravitational waves move at the speed of light, we're actually seeing what happened a long time ago. Those black holes were 1.2 billion light-years away, which means they collided 1.2 billion years ago - that's how long it took for the gravitational waves to reach us. Because gravitational waves aren't blocked by dust, we should theoretically be able to see them from as far away as we want, depending on how good (and big) of a detector we build. We should be able to see all the way to the formation of the universe, which we've never really been able to see before. It will take decades, but we can really start to understand how the universe began. It's an exciting time time to be an astrophysicist. Well over a thousand scientists worked together on this discovery. Engineers built the detector. This is one of the most amazing team efforts in the history of the world, and it will be remembered for centuries to come.